Black Moon's commander-in-chief, Buckshot, makes a close-to-classic return to prominence with the help of Little Brother producer 9th Wonder. Who asked all these golden-era emcees to return to the game? Not I. And I wish, though it pains me to say it, that some of them stayed put in the past. Have you heard the new Fugees song, "Take It Easy"? It won't be easy to force that from my memory banks. But the first time I heard Chemistry, a joint venture between Black Moon's Buckshot and Little Brother's 9th Wonder, the phrase 'a close-to-classic revival' sprung to mind. This is why. Buckshot barely made a ripple on the collective rap consciousness when Black Moon dropped its debut album, Enta Da Stage, in 1993. Still, he wrote some classic underground hits in "How Many MC's" and "I Gotcha Opin". Both evoked the menacing scowl of New York's underground music noir with criminally-minded tales that left listeners in gloomy soundscapes. It was all NYC then, back when Brooklyn's Boot Camp Clik (a crew that included Black Moon, Smif 'n' Wessun/Cocoa Brovaz, Heltah Skeltah, and more) owned the underground. But this is not the Buckshot of old, and yet it is, which shouldn't confuse you. Lyrically, he's still tight on the mic, weaving standard rap braggadocio throughout his patented blend of ghetto observations. It's engaging stuff, though no where near as engaging as a Nas or Biggie. Over the years though, something  maybe the mere act of ageing  wore away at his more nihilistic tendencies, revealing an MC unwilling to perpetuate his prior gangsta lifestyle. So who better to collaborate with than 9th Wonder, a producer with a hard-on for the old school and a hankering for social consciousness. Now we've got the gun-clapping emcee who once said, "I'm just a crazy maniac murder a murder type thinkin'", calling for beefs to be settled with the fist instead of the pistol, "Now A Dayz (That's What's Up)". The 9th Wonder beat stutters like the Duh Duh Duh Man from New Jack City then creeps around the block in cruise control. And when Buck hits you with the hook: "They don't use fists now, they rather use clips / On the streets now all I see is this / Everybody got something to bust, but if you real than you real, knuckle up," you really get a sense that this older, wiser Buckshot has renounced his former life. 9th Wonder crafts his beats to best accentuate Buckshot's conversational cadence. 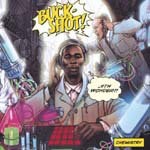 His soulful melodies, those staple muffled and artificial-sounding drums and thick basslines never outshine the MC, allowing Buckshot to snarl his way through the album's best tracks: "Chemistry 101", "Slippin'", and "The Ghetto". But, and this is a warning, most of the beats sound the same: variations on the same minimalist theme. I don't mind it. You shouldn't, either. Near the end of this collaboration, the disc becomes a Little Brother record. The equilibrium that marks the album's best tracks shifts as Rapper Big Pooh and Phonte drop by on multiple tracks. Joe Scudda and Keisha Shontelle turn up on others. It doesn't ruin the quality of the whole, but the production for the last few tracks differs radically from what preceded it. For what it is, a comeback album for an emcee that has languished in obscurity, this release had me hooked harder than a dope fiend.